Mike I would love to organize a GTG. If you will send me a PM of your recommended eating establishments in the area I will make the arrangements. I’m a little busy with the show. You want to organize? Do we have a list of rooms and which vendors are in which rooms? I looked on the website but did not notice the rooms/layout information. I predict we will be sold out by COB tomorrow. Amazing. Well there's always corn on the cob if that happens. Ladies and gents, we're going to have a nice show, see you all there! AJ - Just did a quick scan of the list. You guys have done a fantastic job getting this many rooms booked with terrific manufacturers and dealers. Congrats! Looking forward to the Expo! PS - Weather in Tampa is fabulous at this time of the year: today, it was sunny and 60; tomorrow, 72 and sunny. Someone mention corn on the cob? Bring the toothpicks. 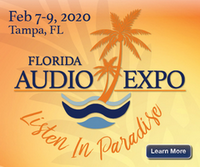 my wife wanted to go to an all inclusive resort in Mexico for some R&R sometime next month.. quick googling told me the Florida Audio Expo is happening. I think I could convince her to go to Florida instead if I could get her in a hotel on the beach (or close enough to the beach) and reasonably close to where the audio show is happening. any hotel recommendation? We might stay in the area for a week, either Feb 5-12 or 6-13.